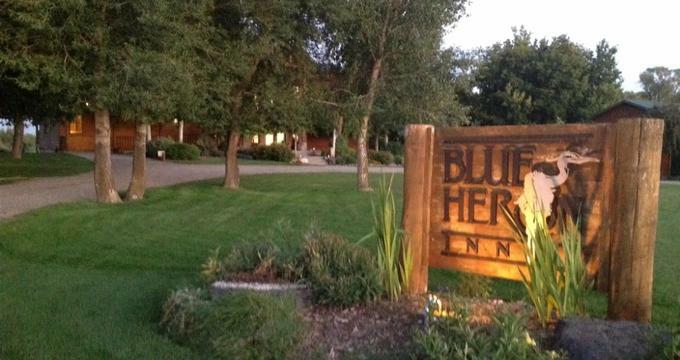 Located on the banks of the South Fork of the Snake River in Rigby, Idaho, the Blue Heron Inn Bed, and Breakfast is a charming, inviting inn that offers cozy accommodations and gracious hospitality. World-renowned for excellent fishing, the Snake River offers an array of activities from fishing and bird-watching to kayaking and swimming, and the surrounding region is packed with things to see and do, including Yellowstone National Park and the Grand Teton Peaks. The Inn features six beautifully appointed and comfortably decorated guest rooms with en-suite bathrooms, fireplaces and private balconies overlooking the river. A spacious loft has a lounge with plush seating, a fully stocked library, and a games table where guests can unwind and socialize, while the lower floor of the Inn has a pool table and movie theater. A gourmet breakfast is served every morning, and a large outdoor patio has a hot tub and seating for relaxing under the stars. The Blue Heron Inn is available for hosting special celebrations and gatherings, such as business meetings, small weddings and receptions, and luncheons, which can be organized in or outdoors throughout the year. The Blue Heron Inn features six beautifully appointed and comfortably decorated guest rooms with country-style décor and comfy furnishings. All guest rooms are spacious and bright with king or queen-size pillowtop beds dressed in luxury linens, down comforters and handmade quilts and soft pillows, and en-suite bathrooms with soaking tubs and showers, or combinations of both, single or double vanities, thick towels and bathrobes, and branded bath products. Modern amenities include flat-screen televisions with cable channels, hairdryers, fireplaces, and complimentary wireless Internet. The Blue Heron is a large, luxurious second-floor suite with breathtaking views of the Snake River. The suite features a king-size bed dressed in luxury linens, down comforters and handmade quilts and soft pillows, and an en-suite bathroom with a with jetted tub for two, a separate marble shower, double vanities, thick towels and bathrobes, and branded bath products. A river rock fireplace adds a touch of romance and a private balcony accessed through French doors from the bedroom boasts beautiful vistas of the distant mountains and river. The Canyon Suite is located on the second floor of the Inn and is decorated in fresh hues. The cozy suite features a queen-size bed dressed in luxury linens, down comforters and handmade quilts and soft pillows, and an en-suite bathroom with a with jetted tub for two, thick towels and bathrobes, and branded bath products. There is a gas fireplace set into a river rock and pine mantle and comfortable seating. The Mallard Room can be found on the second floor of the Inn and is decorated in cool tones of green and peach with hand-crafted pine furniture and a queen-size log bed dressed in luxury linens, down comforters and handmade quilts and soft pillows. An en-suite bathroom offers a tub/shower combination, thick towels and bathrobes, and branded bath products, and French doors lead onto a private balcony with spectacular views of the South Fork River. The Carriage House is separate from the main Inn and offers a private and tranquil retreat for guests with small children and pets. The spacious room offers a queen-size bed dressed in luxury linens, down comforters and handmade quilts and soft pillows, and an en-suite bathroom with a walk-in shower, thick towels and bathrobes, and branded bath products. A large private balcony boasts beautiful views of the South Fork River. The Bunk House is decorated in a Western theme with cowboy boots and hats, handcrafted pine furniture, and denim. This first-floor room features a queen-size bed a queen-size bed dressed in luxury linens, down comforters and handmade quilts and soft pillows, and an en-suite bathroom with a walk-in shower, pedestal sink, thick towels and bathrobes, and branded bath products. A complimentary country-style breakfast is served every morning and includes coffee, tea and hot beverages, fresh fruit and juices, cereals, granolas and yogurts, egg dishes, and freshly baked pastries, and bread. Amenities at the Blue Heron Inn include a complimentary country-style breakfast every morning, a loft lounge with plush seating, a fully stocked library, and a games table where guests can unwind and socialize, and a pool table and movie theater on the lower level of the Inn. The Snake River offers an array of activities from fishing and bird-watching to kayaking and swimming, and the surrounding region is packed with things to see and do, including Yellowstone and the Grand Teton Peaks, which are a 90-minute drive away. The Blue Heron Inn is available for hosting special celebrations and gatherings, such as business meetings, small weddings and receptions, and luncheons, which can be organized in or outdoors throughout the year. The town of Rigby in Idaho offers much to see and do for the whole family from the picturesque Main Street, which is home to many shops, restaurants, cafés, and bars, as well as museums, galleries, and other entertainment. Attractions and activities include the Cedar Park Golf Course, Jefferson Hills and Heise Hot Springs, the Jefferson County Historical Society and Museum, the Kelly Canyon Ski Resort, Yellowstone National Park, the Grand Teton National Park and the Grand Teton Peaks, Harriman State Park, and Mountain River Ranch.